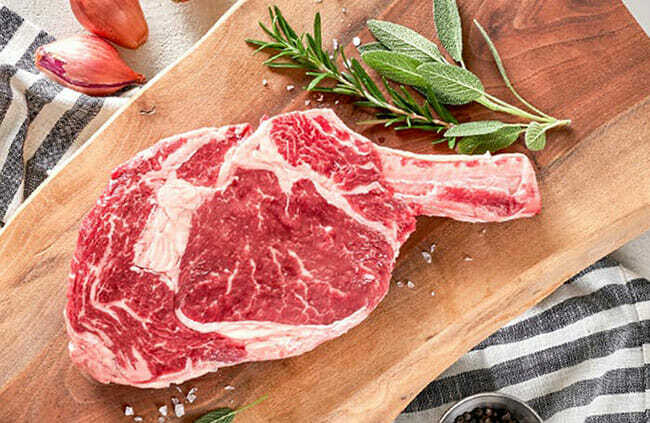 Launched in 2017 and owned by an 8th-generation farmer, Moink is a well-loved meat delivery service headquartered in the scenic city of La Belle, Missouri. Based on social media feedback, its numerous customers have nothing but praise for this reliable source of ethically sourced meat and wild-caught seafood. As one satisfied patron put it, the meat you get from Moink looks just as beautiful as what you see on the company’s website and it tastes even better than you may have hoped. We wholeheartedly agree with this statement. If you want to learn more about this popular service, you can find all the important facts right here in our Moink review. With cost-effectiveness in mind, the folks behind Moink have decided to go with the subscription-based ordering system. As a new customer, you get to choose from 4 subscription types that differ in the types of meat and seafood they include. You can decide on the content of your boxes as well as delivery frequency. The company’s selection of meat and seafood products changes regularly, but it generally includes grass-fed, grass-finished beef and lamb, pasture-raised pork and chicken, and wild-caught seafood. The subscription types available depend on the current selection. For example, you can get beef only, a combination of beef, chicken, and salmon, beef, pork, and chicken or beef, pork, and salmon. If lamb is available, then you can enjoy beef, lamb, and chicken or any other combination Moink has whipped up. The Moink team curates the content of each box, but you are free to substitute the items in your order with any of the numerous additional options available. There is no limit on the number of substitutions you can make. You can receive deliveries every 3, 4 or 6 weeks. Since Moink subscriptions are perfectly flexible, you can skip or reschedule a delivery, add more items to your box as an extra one-time order, switch to a different subscription type or cancel at any point. You can modify or end your subscription directly through your Moink account or ask the friendly support staff to do it for you. The deadline for making changes is Wednesday at midnight prior to the scheduled delivery. Previously in this Moink review, we have mentioned that this service exclusively provides ethically sourced meat. Its stated goal is to support small family farms, contribute to the humane treatment of animals, and help tender-hearted carnivores around the country eat well and enjoy the superior taste of real meat. Its meat is free from antibiotics and growth hormones, even those approved by the FDA. The cattle enjoy a 100% grass-based diet and the animals are never fed any GMO grains. They get to roam freely in the pastures and enjoy a comfortable shelter while the wild-caught fish on your plate spend their lives in the ocean. No artificial products are used to produce a more appealing color of the meat and the chicken is free from any added solutions. There are zero nitrites and nitrates in Moink products and the bacon and sausage you get is free from sugar. In other words, the meat you get from this service is raised in accordance with nature, by small farm owners who treat them right. If you give Moink a try and end up liking it, you can spread the word via its referral program. Each of your friends gets $20 off the first order and you get a $20 credit for every successful referral. Finally, in case you need a good gift for a meat lover, Moink has got you covered. You can give someone a Moink Gift Box or purchase a gift card worth anywhere between $159 and $1,100. Since Moink does not offer mass-produced meat, its selection is limited by the availability of products at the small farms it cooperates with. That means that you can usually choose from about 30 or so meat and seafood items whenever you order. Boxes generally include 8 to 10 items, weighing a total of 13 to 16 pounds, which is enough for about 35 to 40 servings. 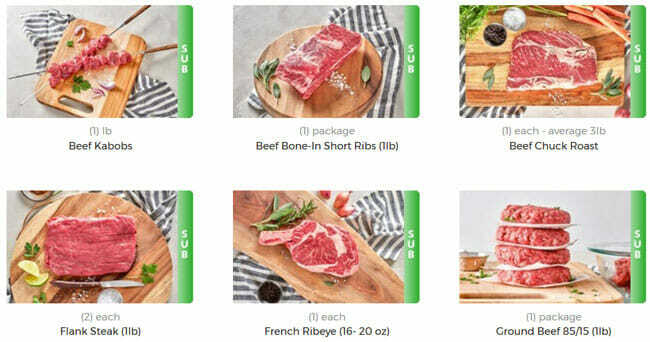 We have already mentioned that there are always 4 subscription box types to choose from, but the options change depending on the meat types and cuts available at the given moment. As we are writing this Moink review, the company’s offer includes the Beef box, the Beef, Chicken & Salmon box, the Beef, Pork & Chicken box, and the Beef, Pork & Salmon box, with lamb products available only as substitutes. For illustration purposes, let us take a look at the contents of all 4 boxes. The Beef box includes beef kabobs, bone-in short ribs, chuck roast, coulotte steak, flank steak, French ribeye, ground beef, and petite sirloin steak. The Beef, Chicken, & Salmon box brings you beef kabobs, chuck roast, coulotte steak, flank steak, ground beef, chicken breasts and drumsticks, and sockeye salmon filets. In the Beef, Pork, & Chicken box, you can find beef kabobs, chuck roast, coulotte steak, and ground beef, pork chops, shoulder roast, breakfast sausage, and thick-cut bacon, as well as chicken drumsticks and breasts. Finally, the Beef, Pork, & Salmon combo includes beef kabobs, chuck roast, coulotte and flank steak, French ribeye, ground beef, pork chops, thick-cut bacon, and breakfast sausage, as well as sockeye salmon filet. As you can see, there is not much variation between the 4 boxes. However, you can customize your order to your taste, add more of what you love, and substitute some of the items with any of about 20 additional options like chicken wings, beef liver, ground salmon, and ground lamb. The items come in packages of various sizes, ranging from 6 ounces to 3 pounds. The packaging is excellent, so everything arrives in optimal shape, without any seals broken or blood stains on the box. With Moink, the pricing is as simple as it gets. No matter which box type you choose, no matter how you customize your order, the price is always the same. You pay $159 per box. Therefore, a serving costs about $4.50 on average. Moink delivers all over the continental US. Orders are shipped via FedEx. They are dispatched on Tuesdays and generally arrive on Wednesdays and Thursdays, depending on location. Once your order is shipped, you get a tracking number via email so you can keep an eye on your box during transit. If there is something wrong with your delivery, do not hesitate to reach out to Moink’s customer support. The staff responds quickly and since the company offers a 100% satisfaction guarantee, you can easily get a refund or a replacement in your next order, provided that you report the issue within a week of delivery. To make sure Moink meets all your standards and expectations, it is important to know its biggest advantages and disadvantages. With a short overview of its pros and cons, you can easily decide if Moink is the right company for you. There is a lot to love about Moink meat delivery. It offers perfectly natural and humanely grown meat and wild-caught seafood that tastes great and contains no artificial additives. Its selection of products is not too vast, but it is likely to satisfy the needs of most meat lovers. Its boxes are easily customizable, so you have full control over what goes into your orders. Plus, you can modify your subscription at any time and each delivery you get comes with free shipping and the company’s 100% satisfaction guarantee. Of course, this Moink review would not be as objective as we want it to be if we did not mention a couple of aspects that could use improvement. It would definitely be nice if the company expanded its offer a bit since meat lovers do love variety. We would also like it if the company allowed its customers to decide on box size. After all, it is an undeniable fact that not every individual or family can fit more than a dozen pounds of meat and seafood in the fridge or freezer. Finally, the prices may not fit all budgets, even though it would be unfair to say that they are not justified by product quality. 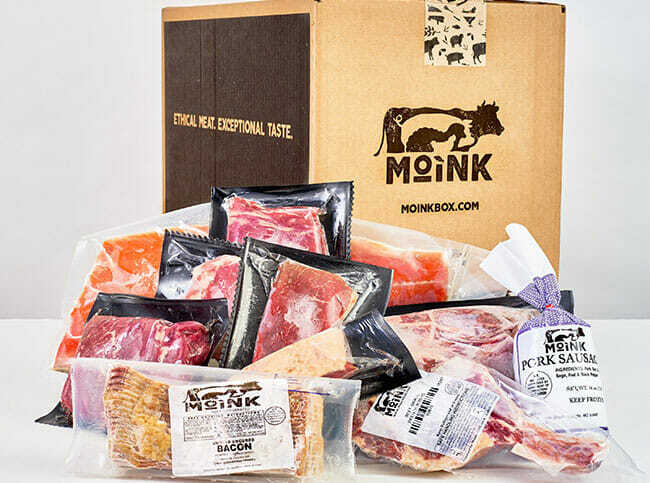 After carefully weighing all the pros and the cons, we can conclude that although not perfect, Moink is a meat delivery service that is worth your trust. It does not resort to false advertising, it delivers meat and seafood whose quality exceeds expectations, and it shows great respect for all parties involved, including the animals, the farmers, and the customers. Simply put, it is a service we gladly spend our money on. Our ratings are the result of an objective and independent evaluation of Moink, generating the final rating that reflects the overall quality of the company. Ratings may change as the service changes. Moink customer rating based on 2 customer reviews. We found 0 verified Moink discounts for April, 2019. If you like Moink but aren’t sure whether they are truly the ideal choice for you, you may want to take a look at our comparisons below to discover if one of their competitors is more suitable for you.